...And Baby Makes Three! : Six months and solid! Nora has turned six months old! We can't believe it's been so long already, seems like only yesterday Carrie was pregnant with her. 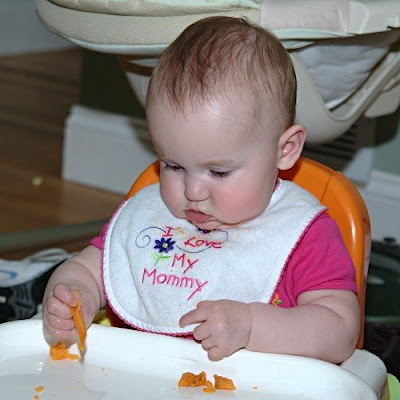 With her six month birthday, we've started giving Nora some solid foods to figure out how to eat. 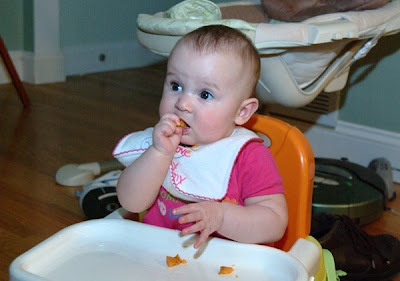 Aside from a few tastes of apple earlier in the week, on her birthday she got to hold and eat sweet potatoes. It went surprisingly well as seen in the pictures. She understood to get the pieces to her mouth and managed to bite off and swallow some of them. She was incredibly excited to be able to do this and it was quite fun to watch. This weekend we'll try some bananas! Way to go Nora! She is very dexterous!